Steve shows Terri a snake with much enthusiasm. I love you steve.I never forgot you.your so sweet. I love you Steve. You were an insparation to all. U WERE SO SWEAT AND NICE THAT I'LL NEVER FOGET U WE MISS U! The bearded dragon in the photo bit steve on the nose. it was funny then but now i think its quite sad. I love this picture. It totally captures that childlike enthusiasm we love so much about him. 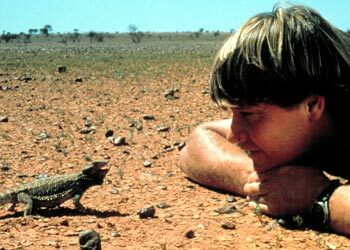 It will always be with great admiration & sadness that i will look at photos, films & memories of Steve Irwin. The greatest spokesman for the protection & conservation of wildlife in my lifetime. To Terri, Bindi and Bob my deepest condolences, my family will miss him dearly & forever remember him. g'bye mate. What a wonderful memory. Isn't that the little guy that jumped forward and whacked Steve on the nose? Go with God, and be Terri's, Bindi's and little Bob's guardian angel. WHAT A WONDERFUL , YET SAD, PHOTO! I will always miss you steve! And I really like that picture!!! This photo and film sequence is how I first saw and will always remember Steve. It captures the boyish passion he had for wild life, but goes far beyond that for me. So many of us lose the passion of our youth. Steve did not and there is a lesson in that for all of us. I'll miss ya Steve.